Home > Posts Tagged "EU"
As someone who canvassed in the streets, knocked on doors, fielded questions at public meetings and in the media, I can testify that those who supported leaving the EU were perfectly clear what they did NOT want from their vote (letters October 20th to 24th) , namely any continuation of the following: the right of 450 million EU citizens to move at will to settle in this country; payments into the EU’s budget; the right of EU boats to fish in the UK’s internationally recognised waters; any role for EU courts in Britain’s internal affairs. Mrs May’s failure to communicate these four simple conditions for the negotiations in a formal UK paper soon after sending her Article 50 notification on March 29th 2017, while the EU Council quite properly declared its own guidelines in its paper of 29th April 2017, is the root cause of the morass of muddle and uncertainty we are currently in. Nobody of course foresaw that the EU’s negotiators would manufacture a problem over the Irish border, or that they and Mrs May’s advisors would propose carving up our country. Letter to The Sunday Times, published 15th October 2017. You are absolutely right about the need for Britain to have a Brexit strategy independent of the EU negotiations. Nothing is more likely to induce the EU to negotiate properly with Britain about trade and money than the prospect of losing unfettered access to what will be, when Britain leaves the EU, its largest export market. At the same time it would lose any prospect of our continuing to make an on-going contribution to their budgets. Unfortunately Mrs May has given scant attention to the “walk-away” strategy if Monday’s latest White Papers (on trade and customs ) are anything to go by. These are largely repetitive confections of wish-lists to which the “stakeholders” are invited to make suggestions, not tightly thought out plans which would be the hallmarks of true leadership. It took looming catastrophe before Chamberlain was replaced by Churchill in 1940. Mrs May needs to go now before another disaster overtakes us. Your extract (10th February) from a government paper about negotiating priorities, reveals what can only be described as a supplicant approach to our fishing position post Brexit, which may also apply to other industries. After leaving the EU, Britain as a sovereign power and signatory of the UN Convention of the Law of the Sea 1994 (UNCLOS) will automatically take over sole responsibility for all commercial rights, including fishing access and control of stocks, in its own Exclusive Economic Zone (EEZ) of the Continental Shelf (the North Sea and English Channel principally). In this matter, there is nothing whatever to negotiate about. There is the matter of historic fishing by foreign countries such as Spain (since 1995 in their case) but we are not suppplicants. The Civil Service negotiators should understand this. While there may well be some horse–trading over fish stock management, the conditions to be applied to the continuation of foreign fishing in its EEZ are for Britain to decide, just as the EU and Norway will continue to do in theirs. The letter from the Conservative MPs for Reform in Europe (23rd January) implies that there is something uniquely special about UK access to a tariff-free “trading bloc of 500 million people”. But for the UK this so-called Single market is not really tariff-free at all. In 2014 we made a net payment of £11,442 Million to the EU to allow £147,928 Million worth of our goods to be imported by the EU from Britain. This makes an average effective tariff on our goods of 7.7%. This needs to be compared with the EU’s average tariff applied to goods imported from countries outside the EU, including our fellow Anglophone countries in North America and Australasia, of 5.3%. There is thus nothing especially “advantageous” for Britain’s access to the EU market as the MPs’ letter puts it. If the nonsensical fears that the EU would impose tariffs on British goods entering their markets were ever realised, then our payments to them would be more than compensated by the tariffs we would impose on their exports to us. Given the enormous £77 Billion goods trade deficit we currently have with the EU we would be nearly £6 Billion better off from this source alone, plenty of scope to reduce business taxation to compensate for any tariff payments they might have to make. But it won’t happen. The Germans, especially, are not that daft! Lord Lexden (Dec 8th) calls on the Government “to build on a scale that the nation needs” with the implication that the current building rate of around 115,000 is insufficient for our needs. But which nation is Lord Lexden referring to? The nation of resident British citizens has a natural increase of around 200,000 per year which corresponds to about 85,000 new houses per year. Allowing for replacement housing, 115,000 is clearly sufficient for British needs. The much larger figures of 200-250,000 houses, continually referred to by planners and builders, are based on the National Statistical Office assumption that net immigration will continue indefinitely at more than a million every five years. (It was 336,000 in the year to the end of September.) Yet if Britain votes to leave the EU, which continued immigration on this scale makes all the more likely, this number will come whistling down. In any case, it is surely morally wrong to break into the precious English landscape with houses, roads, and pylons to accommodate literally millions of people from other countries which are much less densely populated than ours. Stephen Bush was one of six finalists in London on 8th April 2014 and his essay can be read in pdf format by clicking on BushBrexit4. It contains 18 sections and 6 tables/charts. It can be found and read in full on the Britain Watch website on the “Performance of the Economy” Page. In his perceptive article on how foreign London has become, Charles Moore mentions that many of the capital’s residents are “not British citizens and therefore cannot vote”. In fact, all Commonwealth, EU and Irish citizens are permitted to vote in local and European Parliament elections. Commonwealth citizens can vote in British general elections as well, a hangover from the Empire. In London around two million of the 5.5 million electors (36 per cent) are foreigners, a situation without parallel in any other country in the world. A first step to making London a bit less of a foreign city would be to remove the bias in favour of continued high levels of immigration by restricting voting entitlement to British citizens only, fully accepting that this will only be possible in respect of European Union nationals when Britain leaves that organisation. Does Britain need a referendum on its future in Europe? A letter to the Times which was published on Friday, June 8th 2012. Lord Owen’s assertion that the British people should be given a direct say in our future relationship with the European Union by way of a referendum is dead right, but the choices posed by the question must be options which are in the British Government’s power to enact (report, June 7). His question 1 – “Do you want the UK to be part of the single market in a wider European community?” – is both too vague and not something that this country can give effect to, involving as it does an unknown number of other countries which may or may not wish to be in Lord Owen’s outer circle. The countries with which the UK would be associated under the Owen plan are all, with the exception of the Czech Republic, present and former members of the European Free Trade Area (Efta). Why invent another grouping? Britain cannot force the present four members of Efta to accept us back but informal soundings suggest that we would be welcome to rejoin. If the other former members also chose to rejoin Efta that would be fine by us but it would be their decision not ours. The only choice, therefore, that can intelligibly be put before the British people is: “In or out of the EU?” There is no middle way, disagreable as this may be to the British political class with its addiction to fudge. The full name of this paper is “Averting Energy Catastrophe: Ensuring the Security and Affordability of Britain’s Energy Supplies 2011-2050”. Prof Stephen Bush and David MacDonald presented this paper to a Conference entitled “Climate Change: Who is Paying, and for What?” on 19 March 2011. 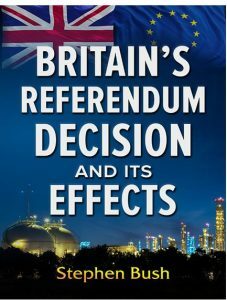 It was later revised and published by Prosyma Research Ltd.
To read the text please click on the link “Averting Energy Catastrophe” which will take you to the paper on the Britain Watch website.